Join us on Tuesday, October 2 for a special preview of an inspiring new documentary coming to PBS. Good Work: Masters of the Building Arts focuses on the artisans who bring enduring beauty to our built environment through their skill, creativity, and pride. Some of the artisans featured in the film will be at the program to answer questions and comment on the works featured in the documentary. Read their stories below. 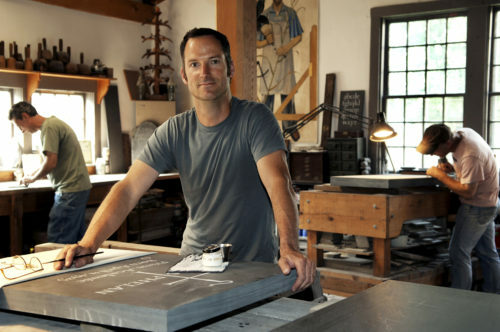 A third generation stone carver and letterer, Nick Benson specializes in hand-carved gravestones and elegant architectural lettering for public buildings, memorials, and monuments across the country. He learned his craft at the age of fifteen from his father John Benson, a renowned letter carver and calligrapher who left his mark on such national treasures as the John F. Kennedy Memorial, the FDR Memorial, and the National Gallery of Art. A master in his own right, Nick Benson designed and carved the inscriptions for the World War II Memorial and the Martin Luther King, Jr. Memorial in Washington, D.C. “My style is a combination of my father’s and my grandfather’s, and it’s constantly evolving. That development is what keeps the passion alive,” he says. Benson was awarded a National Heritage Fellowship from the National Endowment for the Arts for his mastery of the hand-carved letter and was honored with a MacArthur Foundation Fellowship in 2010. He is currently working on the inscriptions for the upcoming Eisenhower Memorial in Washington, D.C.
Stone Mason, Washington National Cathedral, Washington, D.C.
Stone mason Joe Alonso has worked at Washington National Cathedral for more than thirty years, first as a stone mason helping to construct this 14th century Gothic-style building and now as the head mason in charge of maintaining and restoring the Cathedral’s monumental stonework, preserving the beautiful craftsmanship of the generations of masons and carvers who built the Cathedral over the course of nearly a century. A craftsman of exceptional skill, Alonso takes great pride in the knowledge, precision, and care he brings to his work and to the lasting legacy of quality stonework he has left behind. “To be the caretaker of all this masonry–of all the skill that went into producing the Cathedral–it’s quite awesome,” he says. Earl Barthé (1922-2010) was a fifth-generation Creole of Color plasterer from New Orleans, Louisiana. His 150-year-old family company, dating back to the 1850s, specialized in preserving plasterwork for historic buildings in New Orleans, including the St. Louis Cathedral and French Market. “I look at these old buildings, and I know one of my ancestors was involved in building it,” he said. “Now we’re working on restoring it, and it gives me such a strong feeling for how things continue.” Barthé took great pride in the lasting mark his family has left on the city of New Orleans. “It’s some precious work,” he said. “It’s like a diamond, like a jewel, and it’s for you to preserve it.” In 2005, Barthé was awarded a National Heritage Fellowship by the National Endowment for the Arts, the nation’s highest honor in the folk and traditional arts, for his efforts to preserve and foster his traditional plastering skills. Born into a family of glass tradesmen in northern Germany, Dieter Goldkuhle (1938-2011) created and restored exquisite stained glass windows for over fifty years, including more than one hundred windows for Washington National Cathedral. A master of his trade, he devoted his life to perfecting his art. Working together with world-class artists, Dieter was responsible for all the technical aspects of crafting stained glass windows from selecting, cutting, assembling, and firing the glass to perfectly installing the finished piece in its architectural context. He was also an expert in preserving old stained glass windows and enjoyed the special challenges and skills involved in the restoration process. “It broadens me and gives me new experiences in my field,” he said. Goldkuhle’s beautiful work includes making and installing the magnificent rose window on the west facade of Washington National Cathedral. “To cut into a beautiful sheet of colored glass—to make something that did not exist before—there’s a tremendously satisfying reward coming from that,” he said. Albert Parra has been working with adobe since he was nine years old. Raised by his great-grandmother in Old Town Albuquerque, New Mexico, he learned his trade from old-time Hispanic craftsmen. Parra specializes in designing and constructing adobe homes in the traditional style and restoring old adobe homes and churches for Hispanic communities throughout the southwest, including the 300-year-old morada (chapel and meeting place of the Penitente Brotherhood) in Abiquiu, New Mexico. For Albert Parra, building with adobe is a way of connecting to his community and his cultural heritage through a rich tradition of craftsmanship going back hundreds of years in his local region. John Canning is one of the great masters of the decorative painting tradition. He learned his trade in Glasgow, Scotland, where he served a five-year apprenticeship as a church decorator, earning the prestigious London City & Guilds certificate. Educated in old-world decorative techniques, Canning brought his knowledge and skills to the United States in the early 1970s – just as the nation’s historic preservation movement was taking off. A pivotal force in saving America’s past, John Canning and his talented team of decorative painters have restored many of our country’s important historic buildings, including Trinity Church Boston, Grand Central Terminal, the U.S. Treasury Building, the National Building Museum, and the State Capitols of Michigan, Pennsylvania, Rhode Island, and Connecticut. Canning has taught his trade to many talented young craftspeople, including his daughter Jacqueline Canning-Riccio, who has worked with him on such landmarks as the War Memorial Opera House in San Francisco and Radio City Music Hall in New York. Good Work captures Canning and his daughter Jacqueline Canning-Riccio restoring the famous John La Farge murals at historic Trinity Church in Boston’s Copley Square. John Canning & Company received the prestigious National Preservation Award from the National Trust for Historic Preservation for their outstanding restoration work on Trinity Church. Canning is also an honorary member of the American Institute of Architects, the only decorative painter in North America to be so honored.